We are lucky enough to have access to ticket and hotel packages for Miss Saigon Theatre Breaks as Miss Saigon starts it’s UK in 2017! 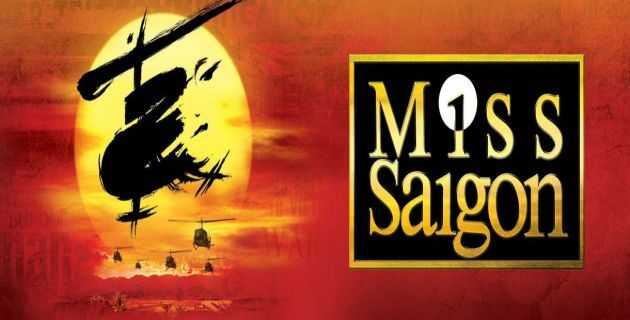 It has been announced that Miss Saigon will be going on tour around the UK in 2017 and 2018 and Theatre Breaks will be offering special ticket and hotel packages. Theatrebreaks.com says A mix of Western and oriental music creates a tense, haunting atmosphere, the stage looks superb and is lit exquisitely throughout and, on this canvas, the cast are allowed to paint a true masterpiece! In the meantime, the film of the 25th anniversary performance comes out in October. Make sure you catch it at a cinema near you. This emotional musical tells the tragic tale of a young bar girl, orphaned by war, who falls in love with an American GI, but their lives are torn apart by the fall of Saigon during the chaotic end of the Vietnam War in 1975. Guests on Miss Saigon Theatre Breaks will enjoy Cameron Mackintosh’s acclaimed new production, already breaking box office records, is set to over-take the extra-ordinary success of the original show when it was at London’s Theatre Royal Drury Lane in 1989. Since then it’s played in 300 cities in 15 different languages, winning awards around the world. Theatre break packages include your hotel stay and your Miss Saigon London tickets. With a haunting musical score including “Movie in my Mind”, “Why God Why?”, “Last Night of the World”, “I Still Believe” and “I’d Give My Life For You” as well as some newly written songs, Miss Saigon delivers a bag full of emotions from joyous laughter to the devastating effects of civil war. Can’t wait until you get to see the show?